Steel is real, or so the saying goes. When 360 staff member Tomas was choosing a road bike his aim was not to shave the most grams or cut the most seconds on a wind tunnel tested aero machine. Rather, he wanted a road bike built for riding, not racing. He wanted to balance comfort and speed, to have a classic bike that could rack up the miles without being sluggish. Also, he preferred a standard threaded bottom bracket and externally routed cables. Naturally, this led to choosing between a titanium or steel frame, and with the Cinelli Nemo TIG he got everything he wanted and then some. See more pictures of Tomas's Cinelli in our gallery. The Cinelli Nemo TIG shows that a steel frame doesn't have to be heavy or old school. According to Cinelli, 'the Nemo has been designed for riders used to riding high-end carbon fiber racing frames, unwilling to sacrifice “race feeling”, but looking for something incomparably pleasurable to ride in the way only a steel frame can be.' 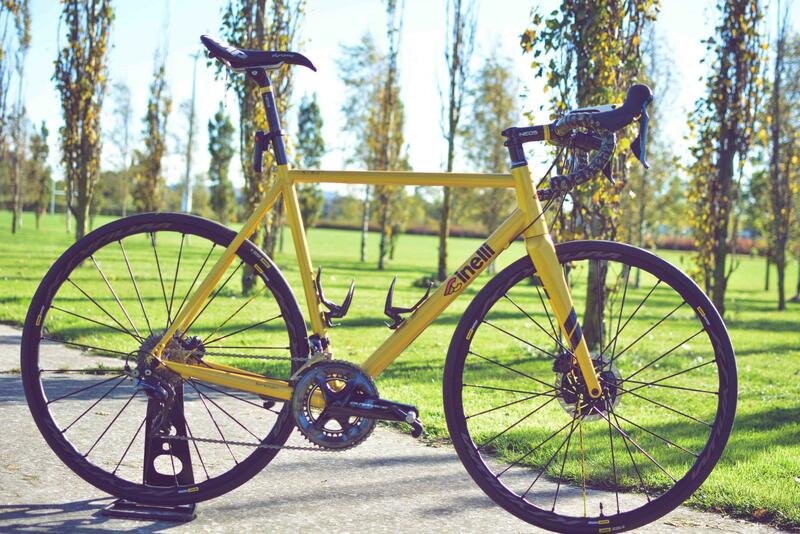 The Nemo is a semi-custom frameset made to order by Cinelli in Italy. You pick one of 60 colour combinations and Cinelli builds a high performance modern classic using high end Columbus Spirit triple-butted tubing manufactured in the factory attached to the Cinelli offices. A matching carbon fork, stem, and seat post complete the package. Shimano Dura-Ace is a groupset without compromise. Flat-mount hydraulic disc brakes with aerodynamic Ice-Tech Freeza rotors provide consistent performance in all conditions with excellent power and modulation. Cable actuated mechanical shifting has an intuitive feel and crisp and light shifting. Redesigned hoods feature an ergonomic design for a comfortable grip. Having finally embraced tubeless road tyres and wheels, the new Mavic Ksyrium Pro Disc UST's do not disappoint. The Ksyrium Pro's provide a fast, responsive feel and feature stout-looking straight bladed spokes, a super reliable hub design, and easy tubeless setup. Perhaps most important to Tomas's build, each wheel features one yellow spoke to match the bike's black and yellow aesthetic. Selle SMP saddles are instantly recognisable by their unique curved shape and large centre cutout. These features culminate in a line of saddles that are comfortable and alleviate pressure on the perineum, preventing numbness and other issues. The Dynamic is a classic Selle SMP with minimal padding, a high back and low nose. The Garmin Vector 3 and Vector 3S power meter pedals have improved upon all aspects of the Vector 2 and all previous complications seem to have been eradicated. The pedals are simple to install and transfer, extremely light and easy to use, and feature simple to replace batteries. They can hold a rider up to 105 kg’s and feature both Bluetooth and Ant+ connectivity. They are the best, most reliable power meters currently on the market. For maximum capability and performance in a cycling GPS, look no further than Garmin's Edge 1030. The 1030's features include an 88.9mm colour touchscreen, 20 hour battery life, preloaded Garmin Cycle Map with turn-by-turn directions and new navigation alerts, Trendline routing to show the best on- and off-road routes, Strava Live Segments, and smart connectivity with a wide range of devices and accessories. The Varia UT800 headlight can be used independently or paired with a Garmin Edge cycling computer to automatically turn on and off, control the brightness, and more. The UT800 automatically adjusts to ambient light conditions, speed and rider profile to extend battery life. The RTL510 taillight provides visual and audible warnings of cars approaching from behind up to 140 metres away using a paired Edge cycling computer or radar display unit. In daylight it is visible up to 1.6 km away from a 220 degree range, so drivers can see you well before you know they're there.